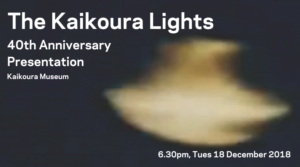 December 2018 marks the 40th anniversary of a series of UFO sightings around Kaikoura. These became known as the Kaikoura Lights. There were numerous sightings and recordings at the time and, despite a Ministry of Defense investigation, the mystery remains unsolved. Join us for a fascinating talk by John Cordy who was a senior air traffic control officer in Wellington at the time of the sightings. We also have an archaeologist who will be talking about references to UFOs in rock art and pre-european records of lights in the Kaikoura area.